I stitched one yesterday... couldn't get a photo until today due to thunderstorms/very bad lighting! 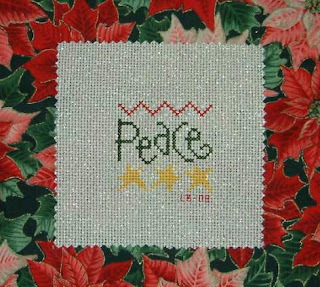 Peace by Country Cottage Needleworks from the 2007 Ornament issue of Just Cross Stitch. Stitched with DMC threads on 28 count mint lugana. 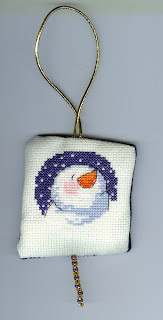 This month's ornie is "Winter Love" by SamSarah Design Studio from JCS 2007 Christmas Ornaments. I stitched it on black for the simple reason that it was the only piece I had that was close in count and size to stitch this one on. Because it was stitched on black, I changed the hat on the snowman on the right from DMC 3799 to a dark green so that it would not get lost on the fabric. Hi! this was a freebie I found on line.. I backed it with dark blue velvet to match the sky, added beads and a gold trim hanger. 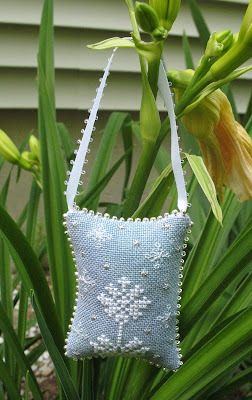 This is my second ornament finish for June, details can be found on my blog. As I was away on holidays the first half of May and sick the second half I am a bit behind with my ornaments. 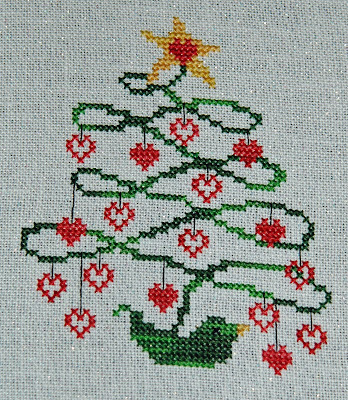 Although I did manage to stitch 2 cards, which are from the Christmas Miniatures Leaflet by The Prairie Schooler, stitched on 25 count Evenweave with DMC threads. 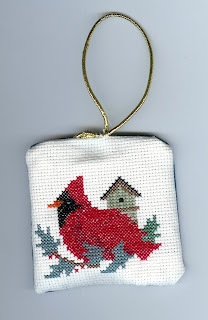 I'm not sure how I will 'ornamentify' the beautiful bird yet, he is from the JCS 2004 Christmas Ornaments issue by Blackbird Designs. Stitched on 32 count ivory Jobelan with DMC threads and Kreinik gold for the stars. 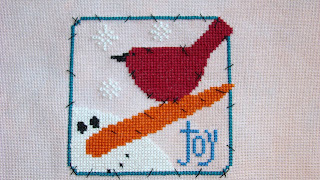 For those of you who have the pattern I left out the Noel (noelle) because my DH asked why the bird's named Noel. Men!! Happy Stitching, Sue in Australia. This was my March ornie, I forgot to post a pic, but better late than never! 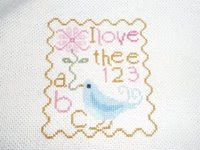 This is a free design from Lizzie Kate, stitched on 28 count raw linen with DMC. I'm on a roll, I just need to make the things into ornaments now. Brittercup designs poinsettia from the 2007 JCS ornament magazine. My blog is one of the monthly featured blogs this month. 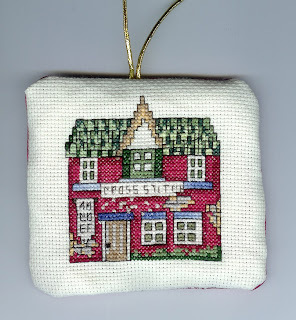 It cheered me up no end, even though my blog hasn't had much stitching featured for a while. Okay, so I know I've only managed to finish two ornaments so far this year but trust me that's two more than last year! 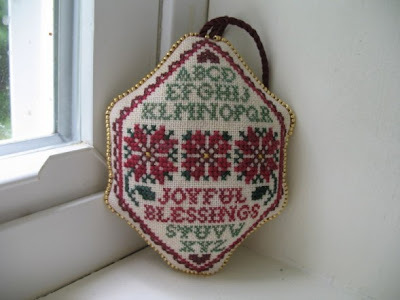 My June ornament is by Angel Stitchin and is called Christmas Joy. It's from one of the JCS ornament issues. I can't remember which issue right now but if anyone is interested I can look up the year. I'd like to finish it as a pillow ornament. 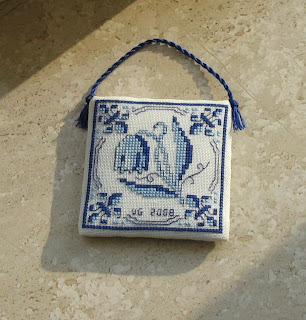 For this ornament I changed the original colors(pinks & greens) to Delft Blue. I'm sorry I am running a little behind. I can't believe it's JUNE already! JUNE!!!! 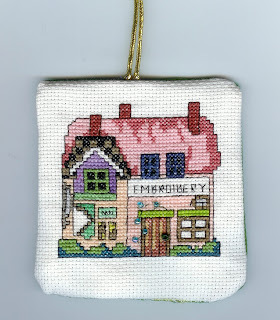 But the June ornament themes are posted and we have a whole new group of featured stitchers, so check them out! I stitch this in 28ct linen, in 1x1 with DMC threads. I love it.